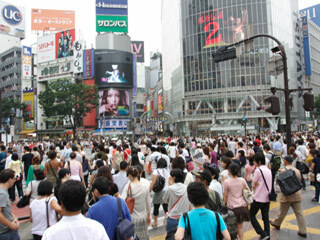 Shibuya Pedestrian Scramble Crossing (渋谷スクランブル交差点) is the most famous pedestrian scramble in the world. It is located at Hachiko Square in Shibuya, Tokyo. On the weekend, hundreds of people are crossing for each signal change for all day long. There is no other place has such a constant mess of people. There are many high angle spot you can see the Scramble Crossing.